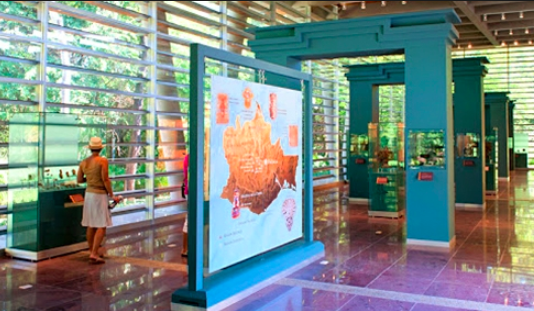 Huatulco has the distinction of being home to the only archeological site open to the public on the entire Pacific coast of Mexico. 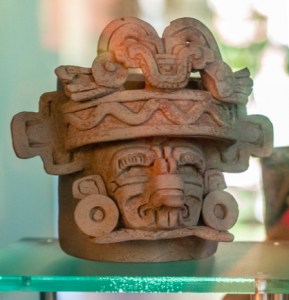 Although it is impossible to determine who originally developed this 3000-year-old-complex, we know that over the centuries it became home to many different people, including Mixtecs and Zapotecs. For some reason not clearly understood, each group who resided here eventually died out or deserted it, leaving nature to reclaim it. 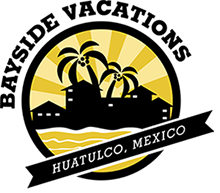 In 1994, FONATUR (the federal organization that developed Huatulco) suspected that there might be ruins buried deep beneath the surface in Copalita. Evidence of stones and ancient shards that had worked their way to the surface prompted FONATUR to joined forces with the National Institute of Anthropology and History and they began investigative excavations. 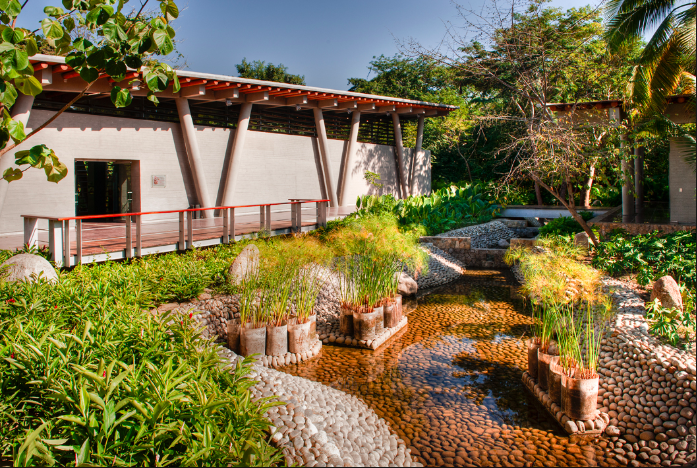 Once the site was confirmed to have archeological significance, Mario Schjetnan, an internationally recognized Mexican architect and landscape architect, was commissioned to develop the project. With Schjetnan at the helm, the site at Copalita has become something more than just another ancient archeology dig. Viewing public parks as “an expression for environmental justice”, Schjetnan proceeded with an uncommon attitude about the relationship between archeology and environmental history. A unique feature of this park is that nature is allowed to co-exist among the excavated ruins. Schjetnan understood that eventually the roots of trees could destroy the ancient structures, but his philosophy in developing the Copalita site was that the flora is as much a part of the history as the ancient buildings. Deciding how much to keep is a fine balance and the park is managed by two directors with distinctly different academic backgrounds. Project Director Raúl Matadamas Díaz oversees the archeological aspects, while Lic. Fernanda Corral Argûelles manages the ecological stability of the area. With beautifully groomed trails, the park sprawls over more than 200 acres, encompassing three different eco-zones: dry forest, wetlands, and Pacific coast. Some 227 migratory birds pass through our region, making this park a bird watcher’s paradise! Although the official hours are 8:00-5:00, a bird guide can arrange to enter earlier or stay later, when birds are most active. Just walking the trails in midafternoon however, I have seen a wide and colorful assortment of our fine feathered friends. The Eco-Archeological Park of Copalita opened in 2010 at a development cost of over 80 million pesos ($5.5 million USD). 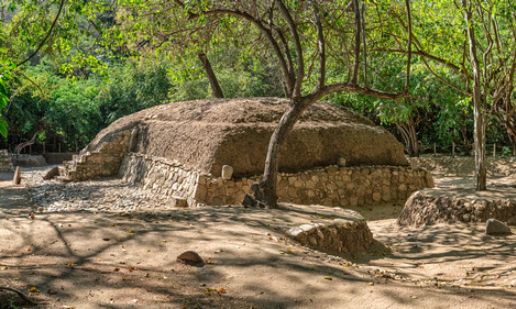 This relatively new excavation has only unearthed 30%-40% of the buried structures, but what is visible is distinctly different from other archeological sites seen around Mexico. Rather than building with carved stone, these ancient people employed round river rock. In spite of being a relatively small site, it is a significant discovery because its origins predate Monte Alban by about 400 years. Monte Alban was inhabited for nearly 1500 years beginning around 500BC. Evidence suggests that the site at Copalita was occupied at various times between 900BC through 1000AD. At the park entry, visitors are directed to an interpretive center with about 35 artifacts found within the Copalita site, as well as numerous pieces from other locations around Oaxaca: Monte Albán, Mitla, Dainzú and Yanhuitlán. This provides a taste of the advanced nature of ancient pre-Hispanic cultures throughout the state of Oaxaca. Most of the trails are flat and easy to navigate, but practical footwear is recommended. Along the trails, informative signage in both Spanish and English helps visitors comprehend what they are seeing. There is a spectacular viewing spot which requires ascending up 100 steps, and those able to make the climb are rewarded with a marvelous view. To one side is an estuary where the Copalita River meets the sea. The opposite side offers an expansive view of La Bocana beach with dramatically high waves breaking along the shore. Aside from the view, flora and fauna there are three excavations within the park. These include the temple of the serpent, the major temple, and the ball park where the winners had the honor of becoming human sacrifices. Speaking at Harvard University, Mario Schjetnan was asked how many archeological sites exist in Mexico. His answer was both humorous and simple “There is only one, it is called Mexico!” Roughly speaking, about 50 unexplored archeological sites are suspected to exist along the Pacific coast. It is uncertain when any of these will be open, since excavating and preserving ancient ruins is such a costly business. 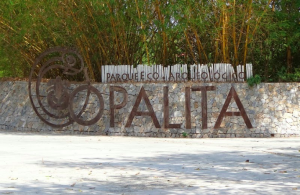 We are indeed fortunate that the Eco-Archeological Park of Copalita is the first to be opened for the public to enjoy; even better is that the government has allowed this place to remain such a diverse ecological treasure. The park is conveniently located a mere 10 KM from the town center. If you are able to tear yourself away from Huatulco´s many spectacular beaches, you will not be disappointed. Getting there: From La Crucecita, follow the highway signs past Tangolunda and Conejos. The park is a stone’s throw past the entrance to La Bocana. Open: Closed Tuesdays, hours 8:00-5:00 but the last entrance allowed without prior arrangement is 4:00.